SMBC was started in 1978, marking 2018 40 years of history. SMBC was started by a man who sensed God’s call to leave his home and everything he was familiar with in Oklahoma, and come to Massachusetts, specifically to the Boston MetroWest region, and start a Bible-believing church. Over the years, God has done great things through the ministry of SMBC. Many have found salvation in Jesus. Some have been called to His service. Children have learned of God, the Bible, and had the opportunity to establish a biblical foundation in their lives. Families have had the opportunity to worship together, serve together, and grow in the Lord together. There’s really no telling just how many people have been reached and helped in 40 years. 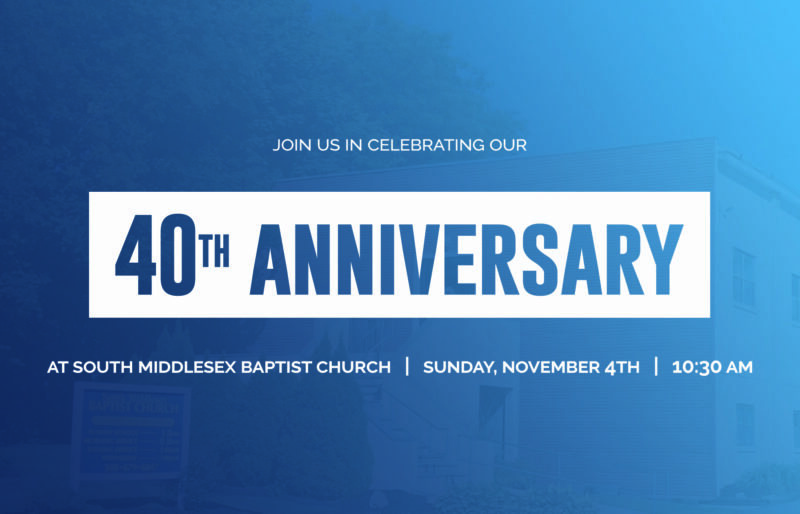 On Sunday, November 11, we celebrated our 40th anniversary by celebrating God. We praise Him for His hand being on our church. We praise Him for working in, and working through our church. We also celebrated our 40th anniversary by trusting God for “40 more.” Trusting that God will continue to work in and through our church. And we praise Him for what He is doing and will do! Thank you to all who came and shared this special day with us. Many who have moved to other areas and different states made the drive to come and be a part of our Anniversary Sunday. Thank you! As the new pastor here, it was such a blessing to see so many come who used to attend at one time, and see the reunion with our current members. What a great day the Lord blessed us with! What a great church the Lord has blessed us with. To our current SMBC family, let’s keep trusting the Lord and praising the Lord for “40 more”! Check out photos from the day here!